Background: Radical chemoradiation is the standard of care for locally advanced head-and-neck cancer. However, patients with pretreatment poor risk features exhibit a poor tolerance to these rigorous regimens and are then usually prescribed short-course palliative radiotherapy which provides symptomatic relief; however, survival outcomes are poor. However, a proportion of these patients may tolerate higher dose of radiation with planned treatment break which in turn may translate into improved locoregional control. Materials and Methods: Patients with histologically confirmed nonmetastatic locally advanced squamous cell carcinoma of oropharynx with poor risk features, treated with split-course radiotherapy were included in this retrospective study. A dose of 35 Gy in 15# 3 weeks was initially prescribed. After planned treatment break of 2 weeks, an additional dose of 25 Gy in 10# 2 weeks was delivered. A weekly assessment of radiation reactions was performed during the treatment course, and response to the treatment was assessed clinically at 8 weeks after treatment completion and on subsequent follow-up. Survival analysis was done at median follow-up. Results: Of the 117 eligible patients, 14 (11.9%) had Stage III (with poor Karnofsky Performance Score) and 103 (88.1%) had Stage IV disease. Toxicity was observed as Grade I 80/117 (68.4%), Grade II 20/117 (17.1%), and Grade III as 17/117 (14.5%). A complete clinical response was observed in 45.3% patients at first follow-up. Patients had a median follow-up of 20 months (range 0–62 months). Median progression-free survival and overall survival were 12 and 16 months, respectively. Conclusions: This regimen can be delivered effectively and has an acceptable toxicity profile. It can be used as a treatment option in patients with poor risk pretreatment features. Head-and-neck region constitutes several delicate intricately organized structures essential for basic physiological needs and social interaction. Head-and-neck cancers and its treatment can cause varying degree of structural deformity and functional disability, so much so that treatment effects could be worse than the disease itself. The morbidity thus caused is more distressing for incurable patients. Oropharyngeal cancers are highly prevalent in developing countries including India. Worldwide age-adjusted incidence rates for men and women are 3.8 and 0.8 per 100,000 populations respectively, with a substantial variation in different regions and countries. In India, the age-adjusted incidence rates in several population-based registries are among the highest in the world. More than 60% of these patients present in locally advanced nonmetastatic stage. Treatment in locally advanced nonmetastatic group of patients entails use of concurrent chemoradiation (CRT), targeted agents, or altered fractionation. However, such radical treatment is highly toxic and causes significant morbidity. Various studies have shown significant unplanned treatment breaks, to the tune from 11% to 45.6%, in patients treated radically.,, This result in loss of tumor control while giving major side effects and this large group of patients could be treated with planned treatment breaks without having significant acute toxicity. In real-world situation, especially in India, a significant number of patients is not suitable for radical treatment due to various reasons including very large disease burden, poor nutritional status, poor performance status, poor socioeconomic strata, age, and comorbidities. These patients are usually planned for short-course palliative radiotherapy as shown in various studies.,, Thus, patients are divided into either radical groups or palliative groups; however, there is scarcity of data to guide optimal management in a palliative group of patients and it represents a major unmet need for these patients. There is a significant subset of patients, especially with poor patient-related factors and low disease burden, who still have a reasonably adequate physiological reserve to tolerate higher dose of radiation which can be delivered with a planned treatment break in between, thereby probably improving the locoregional outcome. In our institute, we have been using split-course hypofractionated schedule of 35 Gy in 15#, followed by a planned treatment break of 2 weeks followed by 25 Gy in 10#, if patients are suitable for same. Here, we present a retrospective analysis documenting the efficacy of this regimen in previously untreated HNSCC patients considered unsuitable for radical therapy. 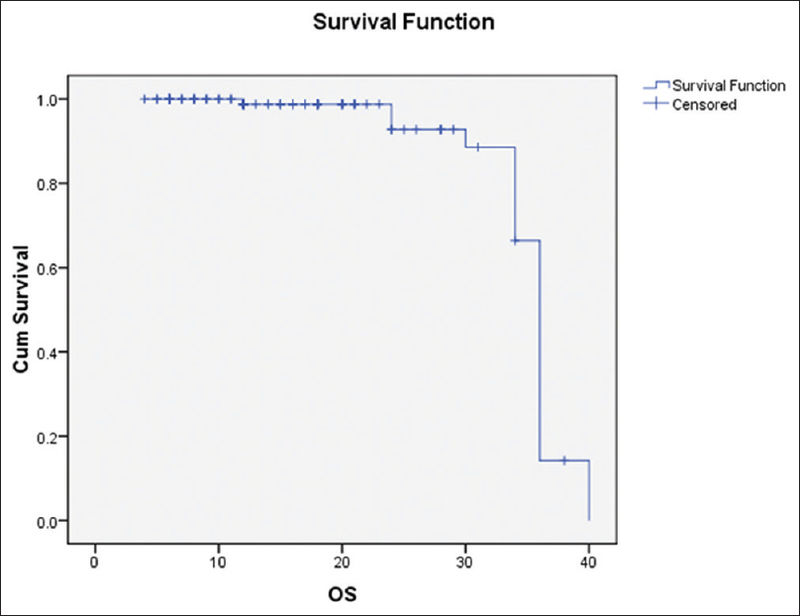 Between January 2011 and December 2013, 117 patients with histologically confirmed nonmetastatic squamous cell carcinoma of oropharynx who were registered to be treated at our institute with split-course hypofractionated radiotherapy with 35 Gy in 15 fractions, followed by a planned treatment break of 2 weeks, reassessment of patient and if fit then further 25 Gy in 10 fractions, were identified from our database. The hospital case notes and radiotherapy records were obtained for retrospective review. Each patient had been reviewed by senior faculty. Decision to not give radical treatment was taken only after review by at least two senior faculty members. Work up of the patients included detailed physical examination, routine blood investigation, fiberoptic nasal endoscopy, contrast enhanced computerized tomography (CECT) base of skull to T4 vertebra, chest X-ray, and ultrasound abdomen. Other investigations including CECT thorax were ordered if clinically relevant. Patients were staged at the time of initial assessment according to the 2007 TNM staging system of the American Joint Committee on Cancer. All patients were treated according to departmental protocol. All patients were immobilized in the supine position using individual neck support and thermoplastic cast. Patients were planned in conventional X-ray simulator. Upper field border was kept at lower border of Zygomatic arch, which provided an adequate margin of approximately 2 cm to cover the gross disease, anterior border was kept 3 cm anterior to the anterior-most disease extent, posterior border was kept posterior to spinous process of C2 vertebra or if the lymph node was involving Level V it was kept beyond it. Inferior border was kept at lower border of clavicle. Spine shielding was done during the second phase, i.e. during delivery of 25 Gy in 10#. Any residual lymph node in Level V after Phase I was treated by electron boost. Patients were planned by parallel opposed fields on Co60 or 6MV Linear Accelerator (LINAC). Total EQD2 (equivalent total doses corresponding to fraction doses of 2 Gy) of approximately 62 Gy was achieved with above-mentioned dosage. Patients were assessed weekly for toxicities during treatment. Patients progressed to second phase only after toxicity assessment at the end of 2 weeks gap. Posttreatment patients were followed up every 2 monthly for 1st year, three to 4 monthly in 2nd year. Tumor response was clinically assessed at first follow-up and median follow-up and was documented as complete response (no clinical evidence of disease), partial response (≤50% reduction in disease burden), stable disease (<50% response reduction in disease burden), progressive disease (any increase in local disease or appearance of new disease site). Standard RECIST criteria were not used as most of the patients were not affordable for serial imaging studies required for it. Symptomatic response was also graded as worsening of symptoms, no change, <50% relief and >50% relief. Survival analysis was done at median follow-up. Radiotherapy-induced toxicity was scored according to the Radiation Therapy Oncology Group (RTOG)/European Organization for Research and Treatment of Cancer acute and late morbidity scoring criteria. SPSS 20 IBM, Armonk, New York, USA was used for statistical analysis and survival curves. Radiotherapy records of 117 patients of locally advanced nonmetastatic oropharyngeal cancers, who had attended our outpatient department were analyzed. Patient and tumor characteristics are shown in [Table 1]. Most of the patients were males (85.5% vs. 14.5%). Median age was 58 years (range of 30–80 years). Median Karnofsky Performance Score (KPS) was 60, and most of the patients (86.3%) were addicted to smoking; out of these smoking indexes of ≤400 were seen in 81.2% patients, which is known to have positive correlation with malignancy. The most common presenting symptom was pain in 65% of cases followed by neck swelling in 25.6% of cases and dysphagia in 9.4% cases. Some patients had more than one symptom, but only the most distressing symptom was considered. The base of tongue (70.9%) was the most common site followed by tonsil (19.7%). The most common presenting stage was Stage IV in 88.1% cases followed by Stage III in 11.9% cases. Histologically, patients were equally distributed into squamous cell carcinoma (not otherwise specified), well-differentiated and moderately differentiated squamous cell carcinoma. Poorly differentiated squamous cell carcinoma was seen in only 8.5% of cases. Radiation treatment was well tolerated. There was no radiation-related deaths and no Grade IV toxicity. RTOG Grade III skin toxicity was noted in only five patients while Grade III mucosal toxicity was seen in 12 patients; however, no delay in radiation occurred due to the planned treatment break. Nasogastric (NG) tube was present in 14 patients at presentation and nine patient's required NG tube during or postradiation. Tumor response was recorded at 8 weeks posttreatment and was based on clinical findings which, if required were corroborated with endoscopic findings. Complete response was seen in 53 (45.3%) patients; partial response was seen in 40 (34.2%) patients while the rest had stable disease. All the patients attaining complete response also had >50% relief in symptoms while 33 patients with partial response had some symptom relief [Table 2]. Median follow-up was of 20 months. Median progression-free survival (PFS) was 12 months while median overall survival (OS) was 16 months. Survival graph as shown in [Figure 1]. Head-and-neck carcinoma is a significant problem in the Indian population with most of the patients presenting in locally advanced inoperable stage. Response to aggressive treatment with CRT is suboptimal and associated with high-treatment-related toxicities and morbidities. In Indian scenario, where patients have poor socioeconomic profile, poor performance status, poor nutritional status, and limited resources the main aim of treatment is palliation of distressing symptoms and maintaining the quality of life. In our study also, most of the patients were from poor socioeconomic status and 87% of patients had KPS <70. Smoking is a major risk factor for head-and-neck cancer. In our study also, most of the patients were smokers with the majority having a smoking index ≤400. An optimal dose fractionation schedule for palliative radiotherapy in head-and-neck cancer is yet to evolve. Hypofractionated schedules have been found to be equivalent to the conventional fractionation, regarding palliative benefits and response; however, palliative regimens using shorter course of radiation have been associated with unsatisfactory survival outcomes. Mohanti et al. treated 578 patients with a uniform palliative schedule of 20 Gy in 5# over 5 days. The median survival was only 200 days (6.67 months). Similar short-course study from our department using QUAD shot showed a median PFS of only 12 weeks. These results signify that although shorter course of radiation is good for palliation of symptoms they have poor survival rates. Thus, although all patients are not suitable for radical CRT, there is a significant proportion with adequate physiological reserve who can tolerate a longer course of radiation with planned treatment break. Our study with a median PFS of 12 months and median OS of 16 months is better than reported in quoted studies. Historically also 3–5 weeks' regimen was shown to be superior to 1–4–8 days' regimen (28% vs. 3% control rate at 3 years for laryngopharyngeal cancer) in Christie Hospital, Manchester. Another benefit of our regimen is that patients are assessed 2 weeks after giving 35 Gy in 15# 3 weeks; this is a good equivalent dose for palliation of symptoms, as shown in various trials ,, and in patients with good tolerance this dose can be further escalated to help in improvement of survival outcomes as shown in our study. Pain was the most common symptom in our study. Symptom relief was well correlated with response to treatment whereby all patients with a complete response had >50% symptomatic relief, with reduction in requirement for analgesics. Some amount of symptom relief was achieved in around 80% of patients. Our regimen was well tolerated with only 14.5% of patients having Grade III toxicity while no patient had Grade IV toxicity. Shortcoming of our study includes it being a retrospective review and only those patients were included who could complete both phases of radiation which may have led to bias; however, it was shown that there are group of patients who are not suitable for radical treatment but have enough reserve to receive higher dose of radiation which improves survival as compared to palliation in strictest sense. This study provides an effective split-course regimen with a favorable toxicity profile, in locally advanced nonmetastatic oropharyngeal cancer, when radical radiation or radical CRT is not an option. Split-course nature leads to reduced toxicities which in turn make this regimen extremely acceptable to patients. However, further prospective trials comparing this regimen with short-course radiation treatments are warranted to prove efficacy regarding improvement in PFS, OS, and quality of life. Parsons JT, Bova FJ, Million RR. A re-evaluation of split-course technique for squamous cell carcinoma of the head and neck. Int J Radiat Oncol Biol Phys 1980;6:1645-52. Ferlay J, Bray F, Pisani P, Parkin DM. GLOBOCAN 2002: Cancer Incidence, Mortality and Prevalence Worldwide. IARC Cancer Base No. 5, Version 2.0. Lyon: IARC Press; 2004. National Cancer Registry Programme (ICMR). Consolidated Report of Population Based Cancer Registries: 2004-2005. Bangalore, India: National Cancer Registry Programme (ICMR); 2008. Brizel DM. The role of combined radiotherapy and chemotherapy in the management of locally advanced squamous carcinoma of head and neck. In: Halperin EC, Perez CA, Brady LW, editors. Principles and Practice of Radiation Oncology. Philadelphia: Lippincott Williams and Wilkins; 2008. p. 807-19. Trotti A, Bellm LA, Epstein JB, Frame D, Fuchs HJ, Gwede CK, et al. Mucositis incidence, severity and associated outcomes in patients with head and neck cancer receiving radiotherapy with or without chemotherapy: A systematic literature review. Radiother Oncol 2003;66:253-62. Agarwal JP, Mallick I, Bhutani R, Ghosh-Laskar S, Gupta T, Budrukkar A, et al. Prognostic factors in oropharyngeal cancer – Analysis of 627 cases receiving definitive radiotherapy. Acta Oncol 2009;48:1026-33. Russo G, Haddad R, Posner M, Machtay M. Radiation treatment breaks and ulcerative mucositis in head and neck cancer. Oncologist 2008;13:886-98. Ghoshal S, Chakraborty S, Moudgil N, Kaur M, Patel FD. Quad shot: A short but effective schedule for palliative radiation for head and neck carcinoma. Indian J Palliat Care 2009;15:137-40. Edge SB, Byrd DR, Compton CC, editors. Pharynx and larynx. In: AJCC Cancer Staging Manual. 7th ed. New York: Springer; 2010. p. 41-67. Cox JD, Stetz J, Pajak TF. Toxicity criteria of the radiation therapy oncology group (RTOG) and the European organization for research and treatment of cancer (EORTC) Int J Radiat Oncol Biol Phys 1995;31:1341-6. Carvalho AL, Salvajoli JV, Kowalski LP. A comparison of radiotherapy or radiochemotherapy with symptomatic treatment alone in patients with advanced head and neck carcinomas. Eur Arch Otorhinolaryngol 2000;257:164-7. Board of Faculty of Clinical Oncology, Royal College of Radiology. Radiotherapy Dose Fractionation. London: Royal College of Radiologists; 2006. p. 40-3. Weissberg JB, Pillsbury H, Sasaki CT, Son YH, Fischer JJ. High fractional dose irradiation of advanced head and neck cancer. Implications for combined radiotherapy and surgery. Arch Otolaryngol 1983;109:98-102. Paterson R. Studies in optimum dosage. Br J Radiol 1952;25:505-16.